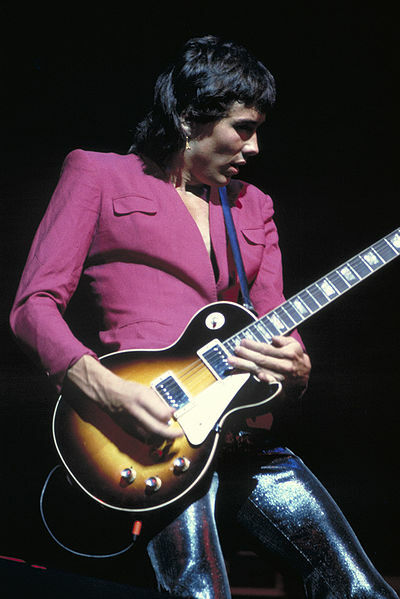 Celebrating senior George Kooymans, the Dutch-born guitarist and vocalist for rock & roll band Golden Earring, who was born 67 years ago today (March 11, 1948) - with 3 live music vidoes: Just a Little Bit of Peace in My Heart; Radar Love; The Twilight Zone. The Golden Earring band got it's start in 1961 in The Hague, Netherlands when 13 year old George Kooymans and his bass and keyboard playing neighbour Marinus (Rinus) Gerritson (15) got together. Over the 50+ years while they've been performing and recording together, Golden Earring has produced 30 albums. In 1968 Golden Earring recorded Just a Little Bit of Peace in My Heart, written by George Kooymans about his breakup with girlfriend Melanie (Milly) Gerritsen (Rinus Gerritsen's sister). Below, Golden Earring performing Just a Little Bit of Peace in My Heart. Melanie Gerritsen and George Kooymans got back together were married in October 1969. They've lived in Rijkevorsel, Belgium since the mid 1970's; son Kid Kooymans was born in 1982, followed by daughter Cassy Kooymans in 1986. Melanie and George Kooymans have been married for over 45 years. Rinus Gerritsen has also been married since the mid 1970's (to wife Gigi) and lives in The Hague; they have two daughters - Naomi and Raven. Golden Earring hit their peak in the 70's & 80's, beginning with the hard rock classic single Radar Love (1973). Radar Love was written by Golden Earring vocalists George Kooymans and Barry Hay and became a top 10 hit in the U.S. and around the world. While Golden Earring toured in 1973/74 during the heyday of their hit single Radar Love, Aerosmith and Kiss were their opening acts. Below, Golden Earring with guitarists George Kooymans and Rinus Gerritsen, lead singer Barry Hay and drummer Cesar Zuiderwijk, performing Radar Love live in 1973. Golden Earring's next big hit single came almost 10 years later, with Twilight Zone (1982). George Kooymans has said he was inspired to write Twilight Zone after reading The Bourne Identity (1980) spy thriller by Robert Ludlum. Below, an older Golden Earring band performs Twilight Zone live in concert in 2006 in their 50 plus years. When the Lady Smiles (1984), written by George Kooymans and Barry Hay, cracked the Top 100 in the U.S. and was a #3 hit in Canada and #1 in the Netherlands for Golden Earring. Although Golden Earring has continued to perform live for over 50 years - up to 200 shows a year - they've confined their concerts to Europe, primarily in The Netherlands. They haven't performed live outside Europe since 1984, which means North American baby boomer fans are missing out on a group which apparently (we'll have to take the word of the Dutch on this!) still puts on a great live show today. Happy 67th birthday, George Kooymans! Just got in to Golden Earring recently. Wow. Incredible song writing, lead guitar, drums, vocals, bass, keyboards, flute. Even the tambourine smokes on some tracks. These guys are one unit. I have seen some older and some of the most recent footage. It all blows me away. I'll be studying their discography over the next few years. Thank you Golden Earring!